This is a great effort by Volgren - well done!! Now all that is needed is for Australian operators to get as up to date as the Japanese and order low floor buses too. tonyp wrote: Now all that is needed is for Australian operators to get as up to date as the Japanese and order low floor buses too. Only from a closed list, as far as I know. Yes from a closed list as far as chassis and bodies are concerned but final finish details can be left to the operator. And the Scania N series and MAN low-floor chassis need to be on that list. I was thinking of something a little more proactive - like the state transport agencies mandating, with exemption for specific areas/types of operation. While not Japan specifically, and assuming it wasn't wrongly reported, Latrobe Valley Bus Lines have placed an order for eight low floor Euro 6 Volvo B5LH / Volgren, which are also a fully low floor chassis, as opposed to the low entry B5RH's which are all that have been seen in the country so far. It will be interesting to see photos of the Tokyo units when they are completed. tonyp wrote: And the Scania N series and MAN low-floor chassis need to be on that list. I guess it is up to Scania and MAN (or others) to make a competitive deal when fleet replacement tenders (correct terminology?) go out. Seems as though the cheap vehicles get picked (complete with shoddy workmanship), rather than vehicles best-suited to the task. Mr OC Benz wrote: While not Japan specifically, and assuming it wasn't wrongly reported, Latrobe Valley Bus Lines have placed an order for eight low floor Euro 6 Volvo B5LH / Volgren, which are also a fully low floor chassis, as opposed to the low entry B5RH's which are all that have been seen in the country so far. Yes, it will be interesting to see interior photos of the Latrobe Valley ones too. Volvo isn't big in the low floor market so its interesting to see them in the RHD market. Also Volgren is building up good solid experience in low floor format so they'll have a head start when the market for them takes off. 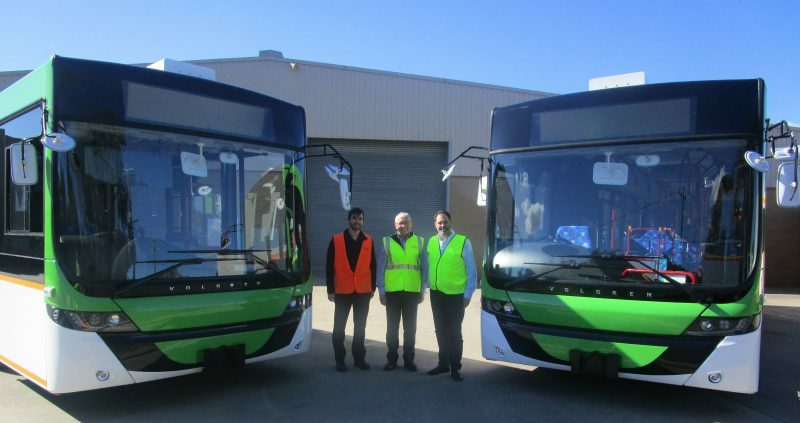 Victorian Minister for Trade & Investment, Innovation & the Digital Economy and Small Business, Philip Dalidakis MP joined Volgren CEO Peter Dale, getting a first hand look at the company’s manufacturing process and to inspect a completed low-floor city bus before the vehicle is bound for Tokyo. The bus is one of 30 units that are soon to be shipped to Tokyo Metropolitan Government who operate around 1,450 buses in the Greater Tokyo region. The Optimus low-floor city buses built on a Scania NUB E6 chassis will be the first of their kind in Japan. Built in Dandenong, the buses are 100 per cent compliant to Japanese vehicle specifications including the country’s complex onboard passenger information systems, ticketing equipment and emergency exit requirements. The visit from Minister Dalidakis follows a delegation from Tokyo Metropolitan Government who were on hand to inspect and finalise the first two homologation units in March this year. Volgren’s latest partnership with Tokyo Metropolitan Government, is one of four operator relationships that Volgren has established, including their ongoing association with Japan’s largest bus operator, the Nishitetsu Railway Company. “This ready to roll solution is well received by operators and is one of the key planks to our success in Japan” Dale said. Triple mirrors look a bit ugly. Fukuoka arctic had more of a standard mirror.